An eleven-year-old teed it up today at t he LPGA Tour’s Honda event in Thailand. PATTAYA, Thailand (Reuters) – While other golfers land lucrative contacts for playing in big tournaments, 11-year-old Ariya Jutanukarn’s reward for reaching her first LPGA Tour event was an ice cream covered in chocolate sauce. When the diminutive Thai teed off at the Honda LPGA Thailand on Thursday, she became the youngest golfer to compete in a major international tour event — men’s or women’s — beating American cover-girl Michelle Wie’s record by five months. 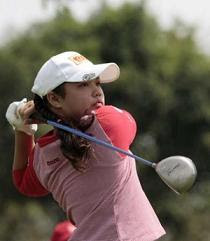 The perky schoolgirl, who took up golf when she was five, is unfazed by the big event and is thrilled to be going toe-to-toe with the likes of Annika Sorenstam and Paula Creamer after advancing through a qualifying round earlier in the week. “A lot of people are watching, there’s a lot of pressure on me but it’s a chance for me to get experience, play with the top players and show people what I can do,” Ariya told Reuters. “I feel very excited, just having the chance to play is amazing — it’s great to make history,” added Ariya, who wears an oversized cap and a pink top emblazoned with the logo of her first sponsor, a local dried fish snacks company. As if the appearance of an 11-year-old on the greens of the Siam Country Club in Pattaya was not odd enough, the presence of big sister Moriya in matching clothes has also raised a few smiles. The 13-year-old narrowly missed out on qualifying, so Ariya is employing her big sister as a caddy. They keep on coming, don’t they? Remember Michelle Wie was 13 when she teed it up at the 2003 Kraft Nabisco. Morgan Pressel, winner of the 2007 Kraft Nabisco, was 12 years old at the time of her qualification for the 2001 US Open(but 13 by the time she actually teed it up.) Pressel was only 18 when she won earlier this year. I don’t know if having your kids play pro golf amounts to a normal or good childhood. Guess it all depends. Ariya shot a respectable first round 75, or three over par. Note that was the same score Morgan Pressel shot today also. Will Michelle Wie play the LPGA’s first major of 2007? Michelle Wie is back but is her golf game?